A collection of Ray's best, '51-'96! Rockabilly, hillbilly and country flavored stomps from legendary rockabilly crooner and bass slapper! LAST COPIES - there are FIVE left! 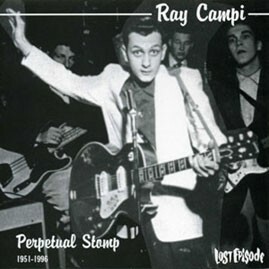 From All Music.com: Perpetual Stomp: 1951-1996 combines 16 tracks that represent Ray Campi's honky tonk and rockabilly sound recorded throughout his career. While Campi has recorded way more material than this disc could possibly cover, this collection gives you a good idea of his overall sound. Along with Campi originals, his choice of covers penned by Chuck Berry, Richard M. Jones, Hank Ballard, and Floyd Tillman gives you a pretty good idea of where he is coming from musically. If you can find them, any of Campi's recordings for Rockin' Ronny Weiser's Rollin' Rock label from the '70s are definitely worth checking into.